A Nativity scene unlike any other! 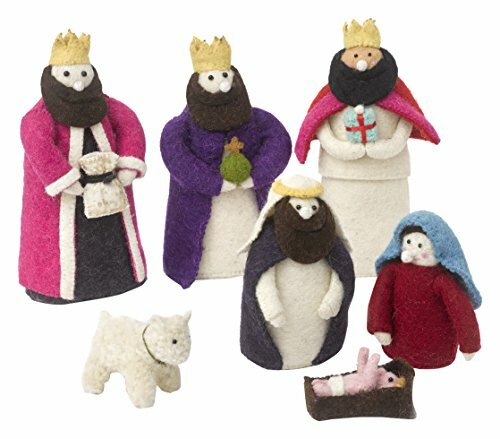 Made of hand felted wool, this seven piece set is comprised of Three Wise Men, Joseph, Mary, a lamb, and baby Jesus. The fantastic colors and charming details will lend pizzazz and fun to your Yuletide celebrations. This set is artisan-made, with hand beading, hand stitching, hand applique, all made of hand-felted wool. The Wise Men measure approximately 9"x5.5"x4.5" each. Mary and Joseph are approximately 6"x4"x3" tall each. Lamb: 3.5"x2"x2". Baby: 2.5"x.5"x1.5". The Wise Men, Mary, and Joseph are weighted with sand at their bases. Arcadia Home felt designs are hand-felted, hand appliqued, and lovingly created from 100% sustainable wool by artisans working in India. The facility where these pieces are produced is an award-winning model of sustainability, which runs on solar electricity, collects rainwater, and recycles water on-site. By collaborating with this artisan group, Arcadia Home is helping to preserve the tradition of felt making in the area, promote business, and provide fair and safe employment for hundreds of artisan felt-makers, sheepherders, and seamstresses. Each handmade Arcadia Home design is as unique as the artisan who created it. Arcadia Home is a member of the Alliance for Artisan Enterprise. By purchasing this design, you are joining our efforts to support artisans worldwide.